Surprisingly, there actually hasn’t been a lot of hype about this book in the Down syndrome parenting community – at least not in my circle – since its publication in 2011. 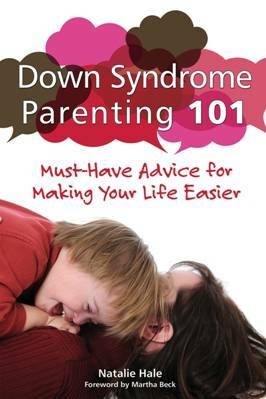 I only recently became aware of its existence and wanted to take a gander at it, not so much because I feel in need of a special parenting guide, but I like knowing what’s out there concerning Down syndrome. Maybe this book would offer up some wisdom that’s not already out there. But at the end of the day, I knew my child was simply genetically different from those without the syndrome. The more I heard people talk about teaching my unborn baby to be “normal,” the more they began to sound like animal trainers whose speciality was teaching kittens to act like puppies. The assumption seemed to be that everyone wants a puppy, and that getting a kitten by mistake was a tragedy, to be avoided if possible, grieved and mitigated if necessary. Yes. That’s how I see it. So I really appreciated that. In the first chapter, the author says flat out that her 26-year old son with Down syndrome is “average. This book didn’t grow from life with a super-achiever; Jonathan is somewhere in the middle of that wide spectrum we call Down syndrome.” I also appreciated that. There seem to be so many books and articles that focus on the “super-achievers” with Ds, and the truth is that most people with Down syndrome fall in the middle, or average. This feels real to me, honest. Unfortunately, further on in the book, she loses me with her yogic/spiritual spin on Down syndrome. She makes sweeping pronouncements about the uncanny abilities of children with Down syndrome to see right into people’s souls, about how they are like angels on earth, blah blah blah. I can’t stomach this type of thing, and frankly, I’ve never seen this type of uncanny ability in Finn. Is he friendly to people? Yes! But I don’t think it has anything at all to do with a special intuition endowed upon him by that extra chromosome; I think it’s more a sort of innocence and even naiveté. He’s not jaded. He’s not worldly enough to be jaded, and perhaps he never will be. In any event, he displays less than angelic behavior all the time, and I don’t think he’s unusual in that regard – so the whole “angel” spin doesn’t sit well with me. is, as far as I know, the only book out there that presents a viewpoint on EI that differs from what’s widely accepted; every other book out there on Down syndrome presents EI as a must. In any event, Down Syndrome Parenting 101 does contain some useful information on schooling for kids with Down syndrome, and one of the big things that drew me to read this was that I had read somewhere that the author is a Down syndrome literacy guru, and I’m at a point with Finn where I am seeing how ripe he is to learn beginning reading, and what a positive impact that could have on his future school placement (among other things). And I’m also completely intimidated by the prospect of undertaking the endeavor to teach Finn to read, so I was looking for information and encouragement to that end in this book. It did at least set me on the right track as far as beginning to research methods that seem to work with the visual learning style that is inherent in Down syndrome. All in all, I think this book has a lot of fluff in it, some useful things, but it could have been a lot more invaluable than it actually is. For instance, I was secretly hoping for a chapter devoted to Potty Training Kids With Down Syndrome, but no dice. Despite my long review here, it’s a pretty quick read, and it would probably be somewhat useful to new and fairly new parents of children with Down syndrome.